This cake might seem like the devil’s work, but the ingredients are angelically light! Indulge yourself with this not-so-naughty chocolate cake, that can also be used for cupcakes, birthday cakes, and sheet cakes. Preheat oven to 350° F. Coat a 9-inch cake or spring-form pan with non-stick spray. Dust with flour; shake off excess. Over a large mixing bowl, sift both types of flour, cocoa powder and baking soda. Set aside. In another bowl, whisk the brown sugar, buttermilk, coffee, vegetable oil, eggs, and vanilla. Gradually whisk in the flour mixture until just combined. 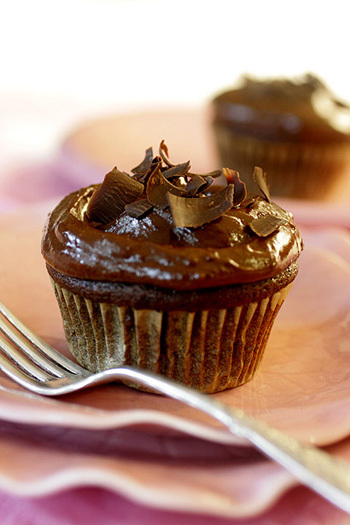 Nutritional Stats Per Serving (1 cupcake with icing or one 2-ounce slice of cake with icing): 242 calories. 5 g protein, 42 g carbohydrates, 7 g fat (1 g saturated), 2 mg cholesterol, 3 g fiber, 165 mg sodium. Make It A Meal: Serve with Chocolate Sour Cream Icing, Chicken Paprikash or Pickled Cucumber Salad. This looks rich and delicious! I love the use of whole wheat flour and buttermilk.